Are you bummed because you didn't get to go to the NAEA Conference this year? Did you go to the conference and miss a session you wanted to see because you were busy scoring free samples? 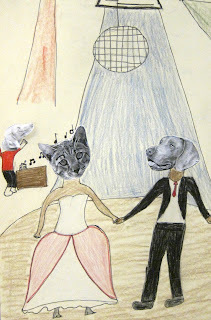 Have you never heard of the NAEA conference and want to know what kinds of things go on there? The session handouts are up on the NAEA website. So, if a presenter uploaded their session powerpoints or handouts they are there. 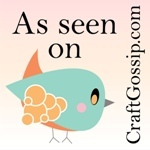 It's a great way to get new ideas and see what you missed! You should be able to see them without logging in. 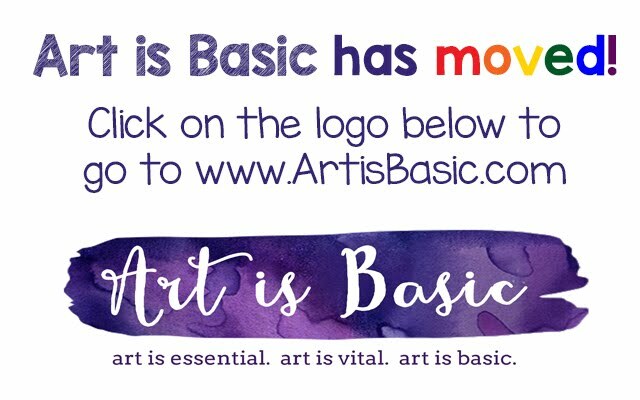 Have a great Spring Break (to those of you who are on Spring Break now) and don't forget to spend some quality "you-time" making art of your own! First, DON'T FORGET TO ENTER THE GIVEAWAY FOR THE PICK AND DRAW GAME!! I will be picking a winner on April 1. Rainbow Fish is an awesome kids book to go with fish art projects. The kindergartners made rainbow fish sculptures from water bottles. 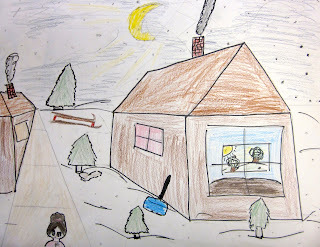 I learned about this idea at the NAEA conference. The lady who presented it did it with large 2 liter bottles, but I used little water bottles instead. 1. Cut off the bottoms of the water bottles ahead of time for the kids. Cut squares of tissue paper for the kids to use. 2. The kids used paper mache glue paste (you could use mod podge or diluted glue as well) to adhere the tissue paper flat to the bottle. 3. Next class period, kids used construction paper to make fins. We glued these with O'Glue bottles (or regular Elmer's glue would work fine.) Then, they cut eyes from white construction paper and used black marker to draw a circle in the white eyeball. They glued on sequins to decorate the fish. 4. As the kids were working I had them choose tissue paper, which I stuffed and hot glued into the back of the bottle. I flattened the end of the waterbottle to kind of make it more narrow and fish-like and stapled the ends together. Some of the staples were not sticking well, so for those, I just hot glued them. 5. Poke a hole in the top with a pointy stick/awl, attach a bent paper clip and tie a string for hanging! The concept is simple. The deck of cards contains face shapes, eyes, noses, mouths and hair. Pick a card from the face pile, draw it. 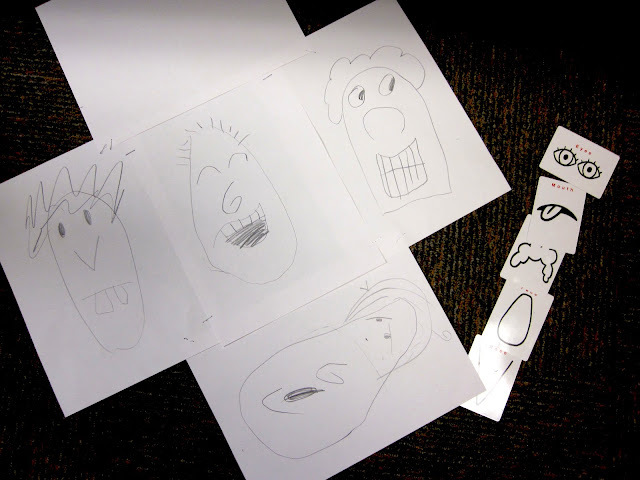 Then pick the other facial features. 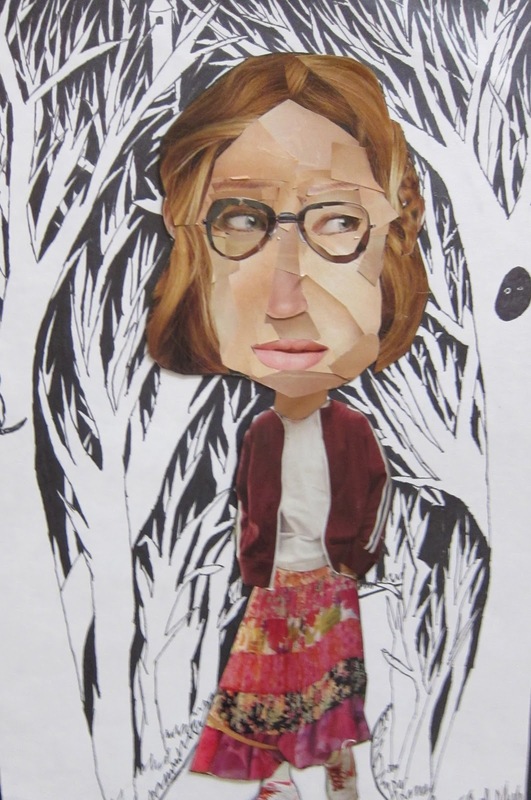 You can add your own creativity by changing the sizes, directions, adding bodies, etc. What are the cartoon characters holding? Where are they located? What are their names? Here is how I set up the classroom. Each table had cards to pick from. The kids moved from table to table. 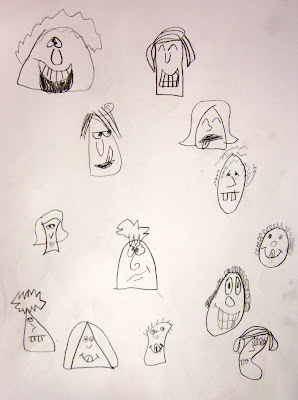 Drawing lots of faces! 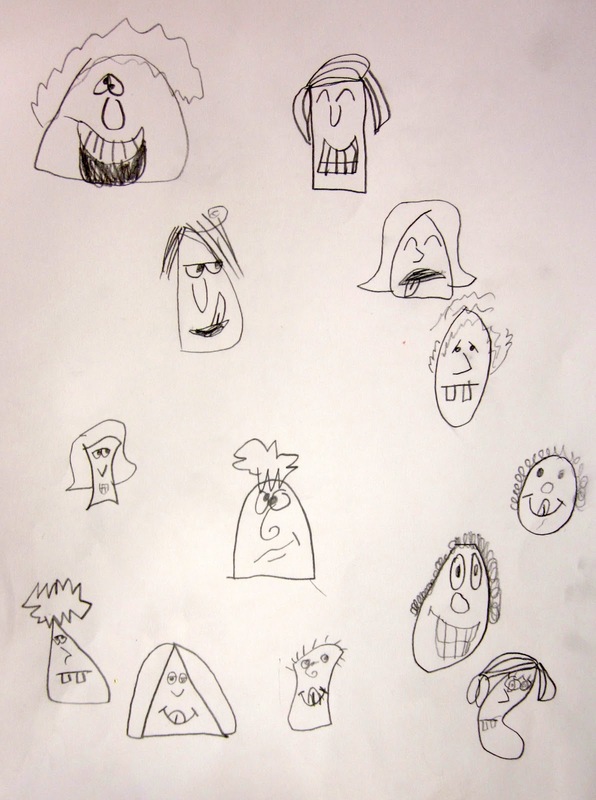 The kids were really excited and wanted to keep drawing more and more. This student stapled together 5 sheets and set them up on the floor. You can try out the game online for yourself! Go here. You can order the game for yourself here for $10 per deck. I think it is well worth the money. 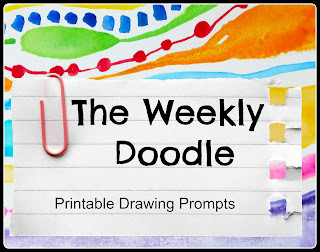 This would be a great game to have in your free-time drawing area. Now.... Time for a giveaway! If you would like a chance to win the Pick and Draw game, leave a comment here. I will pick a winner randomly from a hat on April 1. 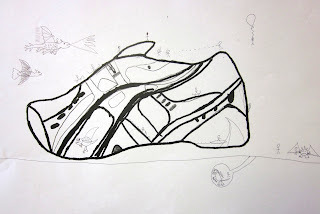 Contour Drawings The students observed the details and lines on their shoes. 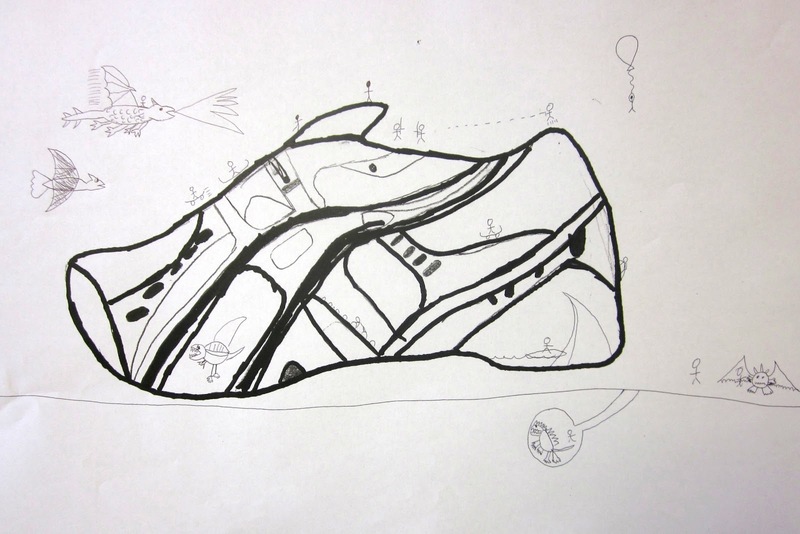 They completed a contour line study of their footwear. Next, they turned these drawings into "miniature playgrounds" for stick people. 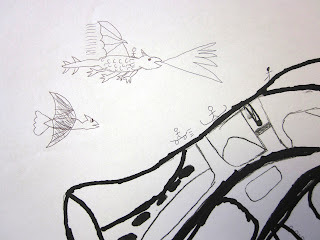 Contour drawing helps define and explore edges through line and locates one object in relationship to another. It also establishes an expressive and accurate representation of the subject by the richness of the lines, thick or thin, crisp or soft, and the speed and rhythm with which they are drawn. 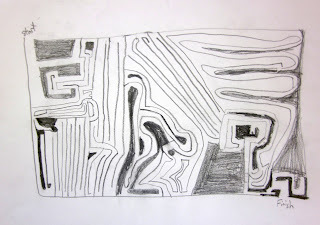 Contour drawing enables the artist to develop the illusion of volume through space and line. 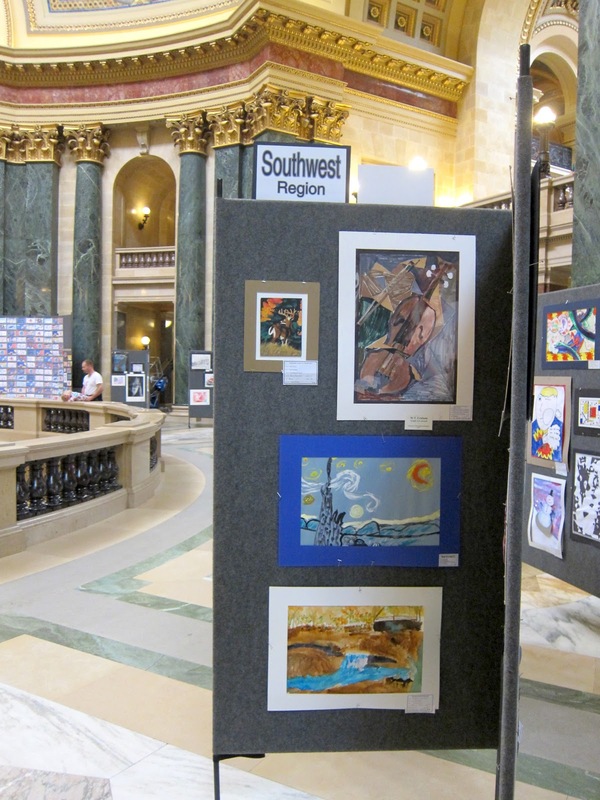 I went to the State Capitol today to see the Youth Art Month Art Show put on by the WAEA (Wisconsin Art Ed. Association). 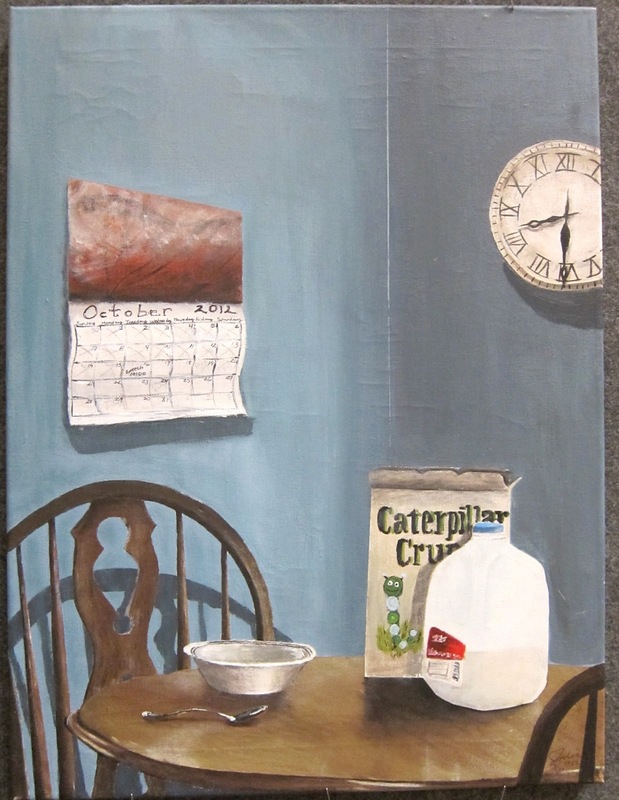 The show includes artworks from K-12 students from all over the state. 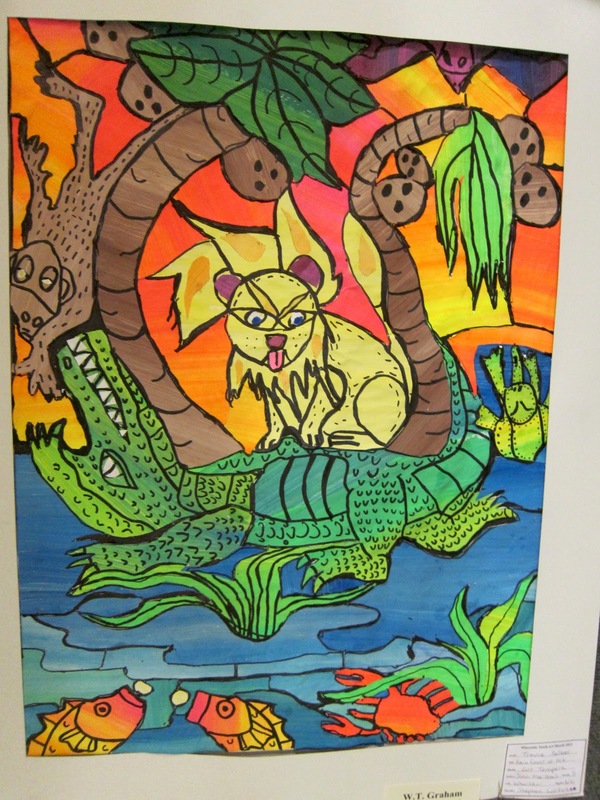 Our school has two artworks in the show. One from the middle school teacher and one from one of my students. I'm so glad hers got chosen for the show because 1) it is a wonderful painting in my opinion! and 2) she was very excited to be chosen (which she should be.) The reception is this Friday afternoon. If you live in Wisconsin, the show will be up through this coming Friday. Here are some pics for you. 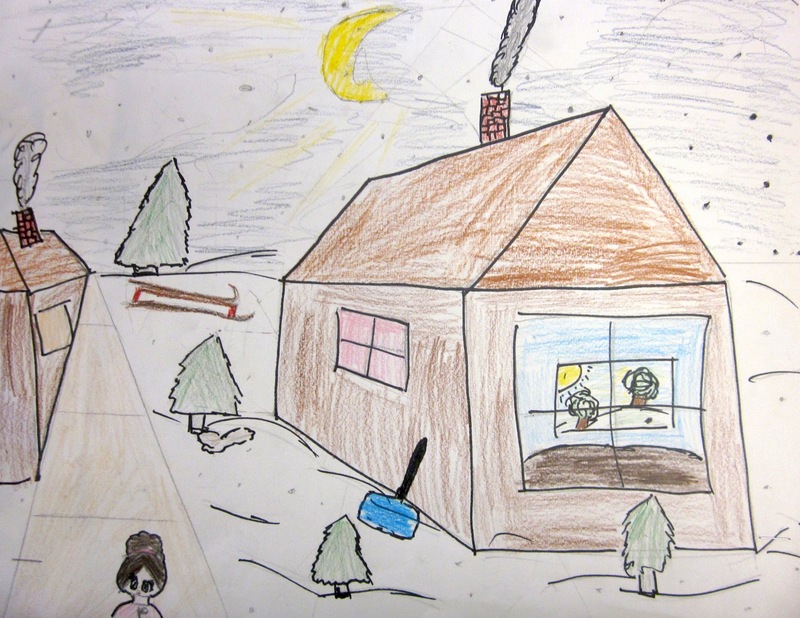 Here is my student's lovely landscape. She is in 3rd grade. I wrote about this lesson here. This photo doesn't do the colors justice. I think it is even more beautiful in person. 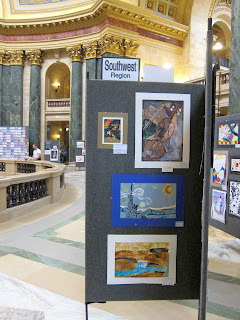 Wisconsin Capitol One Year AGO.. Last year, the art show was postponed a few weeks because of the protests over the politics in Wisconsin. The picture above is my husband at the capitol in the days where protestors slept overnight and he worked crazy long weeks covering the news. 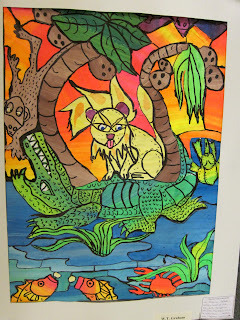 I always take my camera with to get lots of good pictures of all the great artwork at the art show. It is a fabulous place to get new ideas and be inspired for lesson plans. Here are some of my favorites from the show this year. Any other ideas.. let me know! The kindergartners made these lively paper weavings with colored paper strips and paper strips cut from scrapbook and wrapping paper. Then, I stapled them to a white piece of paper and the students stamped a border with gadgets, caps and random objects. 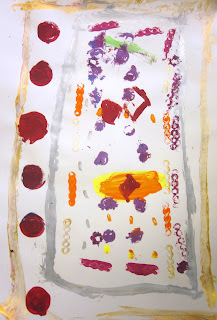 After the weavings, the students played with the gadgets and made a design with paints. Chuck Close fans... have you seen this story on 60 minutes this week? It's about people who have face recognition problems. Fascinating! 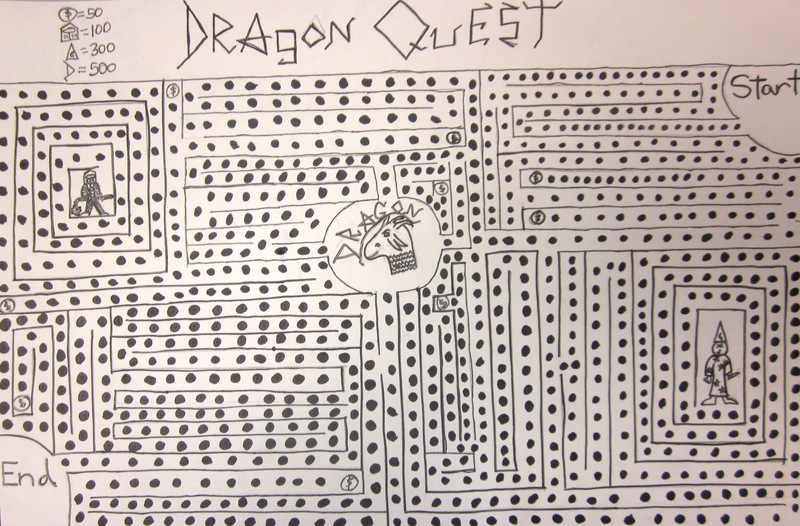 When I was gone on my trip to New York for the conference, one of the sub plans I left was to draw a maze. 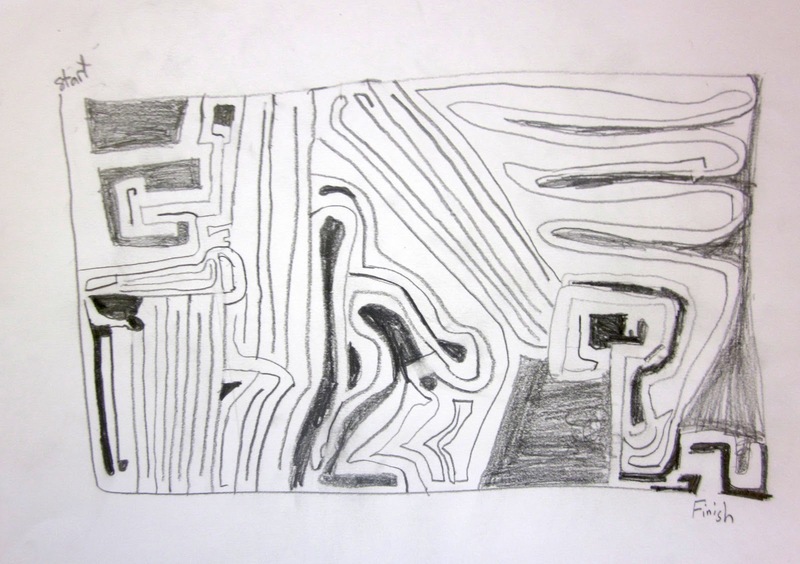 The instructions were to draw a maze lightly with pencil, then color it as they wished. 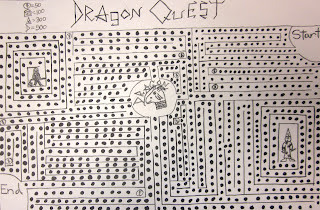 They could choose to include a theme for their maze, or just make it artistic and creative. I am amazed at these mazes! They are so beautiful and fun to look at. I think I'm going to start drawing some of my own mazes for fun now. Some kids in this class LOVE Pac Man. This tiny black and white maze was very interesting. I think many of the kids enjoyed this project because it was sort of like designing their own video game! 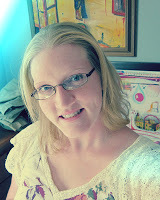 My trip to the NAEA conference!